Tanner Blank of Staples High School during the FCIAC Diving championships at Westhill High School in Stamford, Friday, Match 2, 2012. Executing the perfect dive in the pool is far from an exact science. Shannon Eagen, who has coached the Norwalk-based Shorehaven Golf Club swim team for the last 10 years, will tell you that patience, courage and an obvious athletic ability are a few of the qualities that make a good diver. "It takes a certain strength of character in order to put yourself at risk because it does hurt when you make mistakes. In addition to that, it's basically being physically fit, as is the case in most sports," she said. As one of Eagen's proteges, 17-year-old Tanner Blank, has discovered, honing all the necessary skills can take a whole lot of preparation and commitment. Blank will be taking his talents to Fairfield Prep after diving for the last three years at Staples High, started swimming under Eagen at Shorehaven when he was 11, and credits the longtime coach for igniting his passion for diving. "She was one of the biggest inspirations for diving to me. She really got me into the sport and really got me to enjoy it," Blank said. "It was just a great experience with her." These days, diving is a staple of Blank's life. On top of his commitments for both his high school team and the Shorehaven club during the summer, Blank trains year-round with the New Canaan-based Whirlwind Dive team. He's found success in the pool at various levels, placing 12th at the State Open diving championships for Staples last March, and he believes there's an opportunity for him at the collegiate level. He said he's received interest from a few Division-I schools including Bucknell, Colgate and Lehigh for diving. Still, Blank admits that he's not a finished product in the pool. "I've learned a lot lately. Diving freshman year, I wasn't very good at all," he admitted. "I've grown a lot and I guess they kind of see that I'm progressing towards a better diver. "I have a lot more to learn." Eagen, who was a diver in her own right prior to her coaching career, said that Blank has made "immense" progress in the pool both in his commitment and his overall abilities. At the team's awards banquet earlier this month, Eagen presented Blank with the Shorehaven MVP award and the Clark Falkenstein Diving award, which is given annually to the diver who, "was not necessarily always a winner, but who, nevertheless, tried the hardest because of their love of the sport." Blank was thrilled with the recognition. "It was a great honor. I was extremely surprised and happy to have been awarded that special award," he said. "It was amazing." Blank, who will no longer be eligible to dive for Shorehaven next summer because of his age, will permanently change pools for the high school season. He's transferring to Fairfield Prep, where he can repeat his junior year and strengthen his academic profile, all while diving for the defending State Open champions. "I think Fairfield Prep's prestigious name will definitely help me be noticed," he said. "It's a great school and I'm excited for it." This season, Blank is hoping to make even more progress in the pool by strengthening his abilities in the more complicated dives. 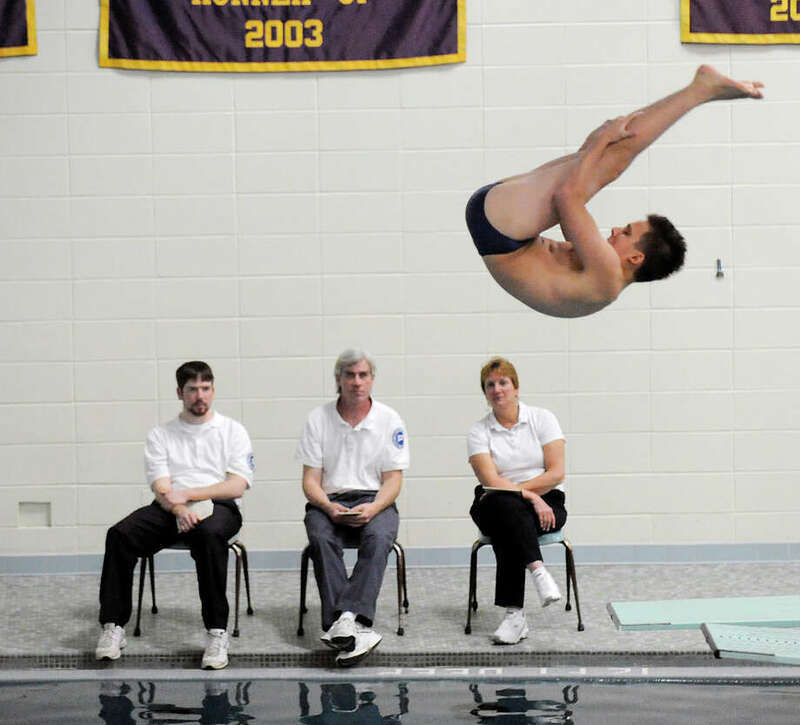 One of his three diving coaches for Whirlwind, Adam Genuario, said that Blank is strongest in the forward dives, particularly the front 2 1/2 tuck, in which divers face away from the board and complete two and a half somersaults in the tuck position. "On one-meter (board) his front 2 1/2 tuck is very strong. This year Tanner learned a front 3 1/2 tuck on the three-meter board and he also learned a back 2 1/2 tuck on the three-meter board," Genuario said. "We're hoping to add some newer big dives to his list this upcoming year." Like Eagen, Genuario said that diving requires more than just physical strength and he believes that Blank has improved his mindset on the board. "Tanner's always been an athletic, strong, physical specimen. But I think this year he's done a big part in improving his training with the mental side," Genuario said. "I think he's really building into all his practice with the right mindset--thinking positively, visualizing all of his dives." One of Blank's other coaches at Whirlwind, Allison Coleman, foresees a bright future for the diver. "I think he just started coming on over the last year and I think college will be a big change for him for the better," she said. "I think that will be kind of where he'll peak."